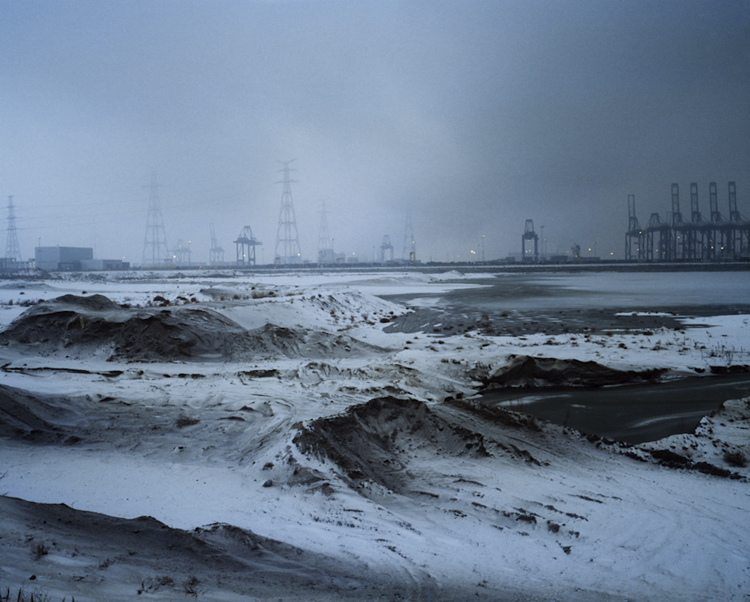 Under construction for nature recompensation, from the series "Unsettled (2007-2012)"
The project "Unsettled" questions the worldwide phenomenon of industrial expansions and its consequences, shown in the study of the Belgian village Doel and the surrounding polder area. The place is threatened by vast expansion plans of the neighboring port of Antwerp and related compensation plans, required by EU law to compensate the expanding industry. Originally meant to balance these nature compensation areas create in fact an artificial contrast between nature and culture. As a photographer I was born at the Dutch side of the border with Belgium, just a few miles from the village Doel. The big changes - fed by political and economic weight - interested me and motivated me to start a series on this local story, which can be seen as an example of a global tendency. In the image above you can see the expanding industry and the new container terminal "Deurganckdock" (finalized in 2005) in the back, with in the foreground one of the contrasting created "wild" nature areas. In the series you’ll find these landscape images combined with portraits of young inhabitants of the area. Leaving a sourish taste by contrasting the young with the local changes, they symbolise the international tendency of global political and economic shifts and the way they manifest themselves to the people and their surroundings. Through the series I’d like to raise question marks at the "progress" character of these changes, happening worldwide. "Unsettled" will be shown in exhibition format and published as a book scheduled for Fall 2013. The next upcoming exhibition is a solo show at Photofusion London (March 15 – April 26th 2013).